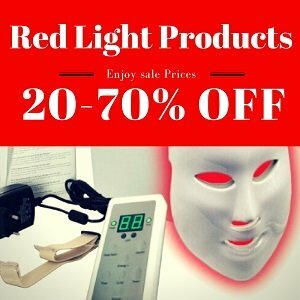 Do Red LED light therapy face masks work? We put it to the test, and the results of our 30-day LED mask facials are in. 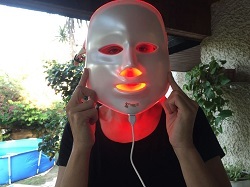 We tried the Project E Beauty 3-color LED Face mask for 30 days, to find if this popular red LED light therapy mask can really reduce fine lines and wrinkles, improve skin elasticity, even the skin, heal acne, tone the skin and make it glow – as it promises. 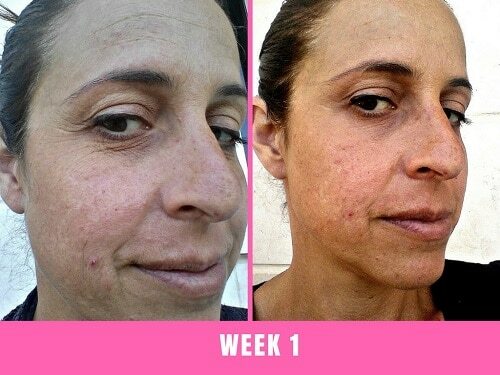 We’ve taken many before & after pictures, starting from day 1 all the way to day 30, and we’ll reveal them below. In this post, you’ll find our detailed results and how exactly we used the Project E Beauty LED face mask, to help you see if it’s worth buying and trying it. The LED mask includes 150 tiny LED bulbs – 60 above the eyes and 90 below the eyes and can be used an unlimited number of times. Red – red light rays (630 nm) promote collagen production via increased blood circulation in the area. It penetrates about 8-10 mm into your skin. Blue – blue light rays (415 nm) are proven to destroy acne-causing bacteria, minimize pores and heal acne faster. Green – green light rays (525 nm) lighten dulled skin and relaxes it. It penetrates about 0.5 mm into your skin. Through the easy-to-use remote control, you can set the intensity level of the light, ranging from 1 to 5. Note: you can’t use more than 1 color per treatment. The device has two cords – one goes from the mask to the control pad, the other goes from the control pad to the electric outlet. Once connected, it’s about 5 or 6 feet long. Either cord can be unplugged when you’re done for easier storage. The remote control allows you to set which color you want to use (red/blue/green), the intensity level (1-5), and the treatment time (5-60 minutes, in 5-minute increments). The lights do not get hot. 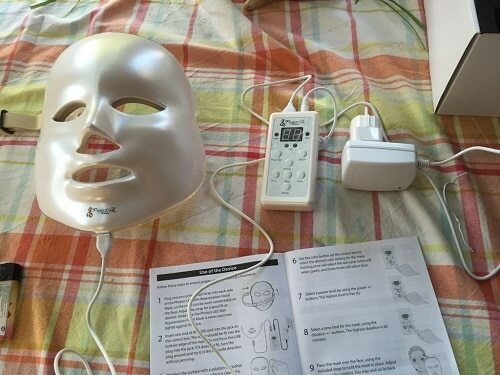 When treatment time is over, the LED mask shuts off automatically. We found the remote control to be user-friendly and easy to use. 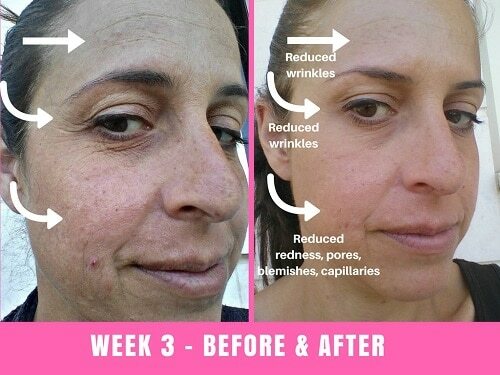 Our happy experimenter tried the mask for 30 days. We chose to follow the clear instructions, and started with one 10-minute red light treatment, followed by one 5-minute blue light treatment – 4 times a week. 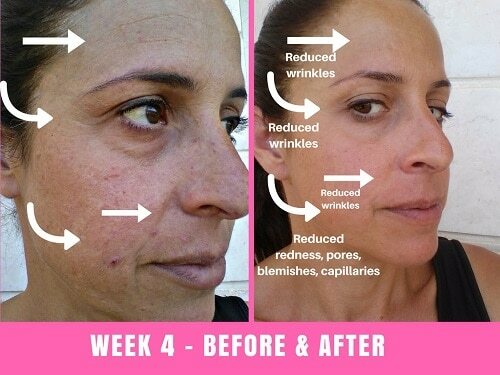 The next week she took it up a notch and did five 20-minute red light treatments, followed with 10 minute blue light treatments. Last two weeks she upped the red light treatment time to 25 minutes while continuing with 10 minutes of blue light therapy. She didn’t use the head strap, because she used this time to lay down, relax and meditate. 20 minutes (15 minutes red light, 5 minutes blue light). Intensity – 3 on the first day, 4 on the next and 5 on the next day and from now on. Total: 4 times this week. the LED facial feels pleasant and relaxing (mask does not get hot), and forces you to dedicate 20 minutes to rest. But, the mask does feel a bit heavy on the face, and leaves a slight mark near the eyes and on the nose. However, the marks disappear in about 30 minutes. My skin feels a little dry and tight immediately afterward, but I use a moisturizer and my skin feels great. My skin looks somewhat more even, and redness is slightly reduced. 20 minutes (15 – red and 4 – blue), intensity level 5, a total of 5 treatments this week. it feels like my skin has adapted to the treatment and does not get as dry as it did on week 1. Also, it feels like my skin is cleansing and removing excess oil. Skin looks more dewy, a bit more glowing, wrinkles near the eyes (crow’s-feet) noticeably reduced. Reduced redness, pigmentation, and capillaries. I’m starting to really enjoy my daily rest time when all I have to do is lay down and relax. I’m starting to get compliments about my glowing skin, from people who have no idea I’m doing red LED facials at home. The daily use of the Project E face mask and adding to my routine was an enjoyable experienced. It has forced me (yay!) to set aside 25 minutes every day to focus on ME. Overall I am very happy with the results. After only 30 days I can say that nothing has disappeared overnight but I can see (and others can too) a noticeable change in my skin and I believe the LED face mask works as it promises. I intend to continue using the Project E LED Face mask and I can’t wait to see my skin after the full 12 weeks. I have a feeling that this is the future of skin care! Project E Beauty LED Face Mask has one of the most affordable prices on the market. We often check this page on Amazon, and if you find it for less than $120 – it’s a great deal. If you have any questions about the LED mask – how to use it, where to buy it or more about my personal experience with it – you can either comment here or message me directly on my Facebook Page. 📢 June 2018 update: we’ve also tried the Aduro LED mask for 30 days. Check out our review and Before & after! Why didn’t you take before and after with the same camera, lighting, time of day? It helps readers believe your results could be real. Actually we did exactly that. Every morning at 7:30 AM outside on the porch with the same camera. The problem was the natural light is different every day at the same time. I’m not a professional at this obviously… I should have done it inside with artificial lights I guess. Oh well.. The facial skin tone is so different it looks totally photoshopped. Not saying that this mask doesn’t help skin appearance at at all -just saying this looks Photoshopped. Can u use it to much? I’ve been using it diligently for a week; 20-30 minutes each red and green and on full blast. I can’t really say if I see a difference in a week…. I read somewhere that the red light can improve the skin but produce melasma if u have that skin type so I’m trying counter product the affect with green light. You have to give the skin the time to rejuvenate between treatments. I wouldn’t do more than 5 treatments a week, allowing 1-2 days in between treatments. Overuse is not recommended. I have seborrhoea dermatitis around the eyes after using a dodgy skin cream and need to help it heal. I’ve read the blue light is good for this? I have pigmentation because of the inflamed skin so I’m worried the LED will make this worse! If your condition was caused by this cream, it will heal soon. I wouldn’t worry about it. At this point I wouldn’t try and light therapy for it because it’s around the eyes and any light therapy is used with goggles. I highly recommend that you try pure hexane free castor oil (which is best for skin in my experience)or coconut oil around your eyes 2-3 times a day. The Project E mask doesn’t use goggles and as my problem extends beyond the immediate eye area I’d like to give it a go. 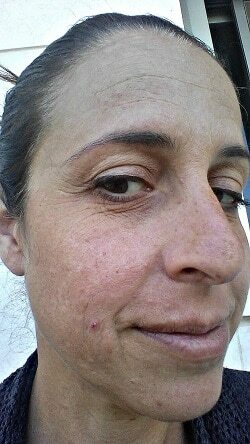 My skin is very dry and itchy as well as inflamed – my derm says its because the skin barrier is damaged and it needs to repair itself. I was thinking red light would help the skin barrier and perhaps blue light for any inflammation? Yes, red light therapy can help, but I would still consult with your dermatologist to make sure it’s safe for your condition. Red light therapy is supposed to speed up skin healing and reduce inflammation. Blue light therapy reduces inflammation by killing bacteria mainly. Bacteria can can cause inflammation, like in the case of acne. I hope this helps and good luck! Angela, I had a similar situation occur after being prescribed a steroidal cream for a chemical burn on my face. It was horrible. I tried everything! The thing that did the trick, Aveeno Eczema Cream with soothing colloidal oatmeal. Saw a major difference in 24 hours! They seem to have different models. Which one did you use? I have the 3-color one, but it’s hard to find it at this point. The 7-color one works the same way, it only has more optional wavelengths (colors). Can we use LED red light therapy for neck? Yes, you can, but not through a LED face mask, you’ll need a handheld device. I didn’t intentionally use it for my neck but the way I wear it the red must shine on my chest because I notice a difference there. The before picture is very close up & the after pictures are furthur away, so I really can’t accurately assess the results. Take pictures at the same distance. Can 12 year old girl’s use light therapy?? At this age you don’t need anti-aging treatments. However, blue light therapy can be used at your age to treat acne – it’s very helpful and scientifically proven to kill acne-causing bacteria. Would you say it was ok to have your eyes open with the mask on? I felt like the light is really bright and did not dare open my eyes! I hoped i could use the mask watching tv ( im not good at relaxing laying down for 20-30 min). Did you research different devices and decide this was the best one? I am looking for something as close to medical grade as possible. do you have to replace anything in it after certain number of uses?Like in neutrogena? No you don’t. This mask is made for long term use and the LEDs should work for at least 10000 hours. Is this ok used on skin with rosacea?? 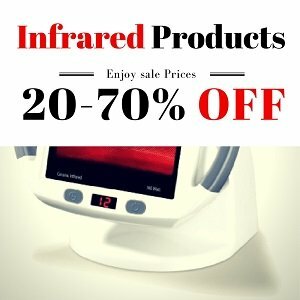 Many people I know if have seen improvement with red light therapy, but some have not. There’s a bit of a controversy on this subject. I would try it and pat close attention to the skin reaction. If there are no side effects – I would keep doing it. Read the post first. I bought one and the remote does not work. How to fi it? Contact the store you bought it from (Amazon?) and they’ll replace it for you. You don’t have to fix it. Yes, it can be used after a scrub. Yes, it can be used with the serum – but it should be applied only after the treatment. Thanks for this! Now that it’s been a while, can you share your 12-week results? Hi I have 7 colours project E mask and instruction says you can’t use mask more than 20 minutes each time so is it bad to use 15 minutes on red and then for 5 minutes all other colours because total is 45 minutes strength 3. I wouldn’t use the mask for more than 25-30 minutes at a time. You can use different colors at different times, but I would mostly use the red and the blue. Many thanks for answer I have one more question instruction says you can’t use mask after sunburn I am going on holiday and of course i will have sunbath what it means I can’t use mask on tanned skin if it’s not sunburn but nice sunbath. Do I have to wait until tan disappeared from skin completely ? No, you don’t have to wait if the skin is not burnt. However, I would advise to not expose your facial skin to the sun at all – if you want to prevent the aging caused by the UV radiation. I have the Rubylux infrared bulb grade A . Is this Led mask better for facial skin? I read very good revieuws on Amazon about the Rubylux bulb also for toning and diminish wrinkles for the face. Yes, it can also work for anti-aging – but it gets very hot and you have to keep it at a safe distance of at least 12-24 inches away from your face. The LED mask does not heat up and thus can be used directly on the skin. You can definitely try the bulb first though. I think I am going to try this. You look amazing! Just click on the links inside the post and you’ll be directed to Amazon. Other than the Aduro LED Mask being lighter and portable, is it better than Project E mask? Will LED work on nasolabial folds? Both masks have worked for me…and yes, they work on nasolabial folds, though it takes more time than other lines and wrinkles. The only way to really find out is to try…good luck! Hi I have brought the mask after reading your reviews. It’s fantastic at 62 it has taken years off of me. It is trying my eyes out can you recommend any goggles that will fit under the mask? Thanks for your help. I’m glad to hear about your results…fantastic! As for goggles, I don’t know of goggles that fit under this mask, but I suggest you use 2 small pieces of cloth, folded a few times, and place it over your eyes before you put on the mask. That’s what I do and it works fine. Did you buy the Project E brand? I purchased a less expensive one and I don’t see any results. Could the lights be different? Hi, Yes I purchased the Project E seven light from Amazon it was the same price as the 3 light. Sorry can not comment about the lights. Hi, Meital. Your results are pretty amazing and give me faith that LED therapy works! I just purchased a different brand that looks identical to the one you used. One problem that I have with it is that it’s not very comfortable for me. It rests heavily on the bridge of my nose and creates a dent, although I’m sure I could find a way to pad that area for future use. Another concern I have is the rubber around the eye holes, which covers areas of primary concern. Did you use your mask with the rubber things or without? Considering the improvement in the area around your eyes, it clearly worked, but I’m thinking the mask might need to be used without the rubber things to target those areas. The Project E mask that I have feels uncomfortable on the nose as well. I wrote that in the “cons” section I think. I use a small cloth folded a few times to relieve the weight on my nose. I also have the rubber around the eye holes and there are no LED lights directly reaching the eye area. However, led light therapy has a general effect on blood circulation all over the face, which reaches the eye area as well and other areas that are not covered directly by the light. If I were you I would first try the mask you have, and see your results. If the results are satisfying and red light therapy works for you – I would upgrade to the more comfortable and uniquely-desgined Aduro mask. Thanks, Meital! I appreciate the insight. I’ve seen the Aduro mask online also, and wasn’t quite ready to shell out the extra cash, but if my current mask works well, I may take your advice and upgrade. The other thing about my current mask is that the mouth hole is too low and lines up with my chin. I guess the alignment would not be the same for everyone, since the length of a face and the corresponding location of facial features will vary from person to person. Thanks again! To my knowledge green is a actually recommended for hyperpigmentation. However, there is no current research that proves it, or proves that it makes it worse. Is it okay to continue my routine skin care korean products after mask treatment? Yes, any skin care routine should be o.k, as long as it doesn’t contain ingredients that cause skin sensitivity to light or heat. 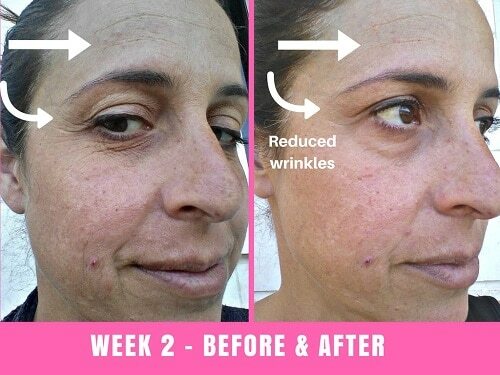 For example, retinol can not be used along with this treatment. I have retinol in my night cream but it’s not a prescription retin A. Is it ok to use it at night before bed? I have been using my night cream forever and my skin is not sensitive to it. I will do light therapy in the day. Is this ok? It sounds o.k to me, yes. But pay attention to your skin and look for any reactions – to be on the safe side. I have the beauty star model which looks identical to yours, have you heard anything about this brand? Great results by the way!!!! Haven’t heard of it but I’ll check it out. Come back and tell me about your results after some time, I’d love to know. Hi I was just wondering if you had any makeup on your skin in the after post for week 4? You skin looks great ! also wondering if you were able to post a picture of your 12 week results? Thanks so much. Is there any danger to the eyes from any color light in mask? Do I see a silicone type of material surrounding the eyes? The silicone material around the eyes is around the holes for the eyes. It is recommended to close your eyes during treatment and I cover them with a peace of cloth folded a few times as well. The light is not really dangerous, but it is very bright. 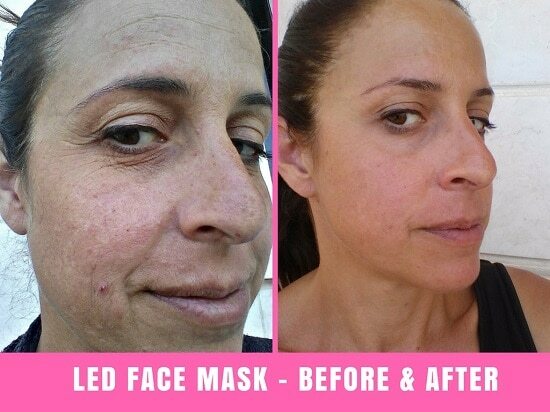 Have you continued using the mask since and have you seen more results. Enjoyed reading the reviews thus far. I am particularly interested in reducing pigmentation and brown spots. Read the review to find the right light in the Aduro for pigmentation… good luck! Do you think the Adirondack works better than the other masks? Hi! I just received mine today and can’t wait to use it. The mask has 7 colors and it comes with a collagen gel. Shall I use the collagen gel before the mask therapy or after? Thanks in advance. A few years ago I purchased a product called Light Slim. This is a hand held device with infra red lights. I used so much it ‘died’ on me lol☹ Would you happen to know if this product is still being manufactured or have you even heard of it? …or perhaps this has been replaced with the Face Mask ..the Aduro? Unable to find a site. When I googled it I got your site. To my knowledge that information is not correct. Fat cell breakdown can happen with infrared light therapy which is a different wavelength, and that’s why it’s known that infrared saunas can help with cellulite and weight loss. Do not worry. Which lamp and color light would you recommend to fade sun spots? Which one for severe acne? For sun spots I would recommend green light, for acne the blue light followed by red light. Is the red light not recommended for hyperpigmentation. I’ve read people above saying it makes it worst but I can’t find evidence of this? For hyperpigmentation, I would recommend the green light. For some people red light worsens pigmentation – for others it helps. To be on the safe side, green is best. Hi, is this applicable for freckles? Yes, but use the green light instead of the red. I am interested in getting an LED mask however am contemplating between the Aduro mask and the new Project E Beauty 7 Color LED Mask which is supposedly 50% more light weight than the previous generation. The only reason I am even thinking of Project E Beauty is because somehow the before and after pictures of Project E Beauty in your review seems to be much better than the one with Aduro. Any chance of you uploading a latest picture to see how the mask has been working so far? Hello! I loved reading your review. Can you please tell me if the mask is supposed to have direct flat-on contact with the whole face? I find this hard to do because of my face shape. Also I have rosacea and some hyperpigmentation. I was thinking of blue then green. Thoughts? Lastly do you clean before and after use? With what please? THANK YOU!! Hi Gayle:) Yes, there is a direct contact with most of the face. And yes, combining blue and then green is exactly what I would recommend! :) As for cleaning, I don’t clean it every day, maybe once a week or two, since I use it on a clean face and the light doesn’t make you sweat or anything. I hope this helps! Hi I just got my project e led mask.just wondering after using 10 minutes red light treatment can I do 5 minutes blue treatment straight away. Yes, you can – you can even do 10 minutes. Good luck! Hi, I have just puchaced Collagenious collagen face mask. I suffer from dermititis on my face. what is the best light for me to use? I would try alternating between red and green. You can, if you provide a link back to my site. Thanks. will do, thank you for your quick response and outstanding review. My concern is acne and not much for anti aging. Should I use the blue light longer than red then? Yes, you can use the blue light for 20 minutes daily. Have you tried the new wireless version of the E-Beauty led Mask? No, I haven’t. It sounds more comfortable to use, doesn’t it? Thank you so much for your reviews! 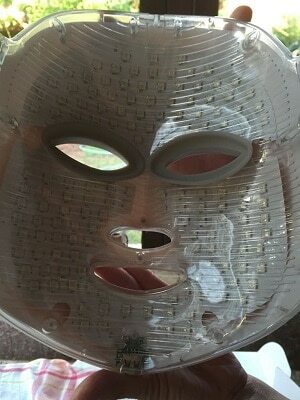 I am a beautician looking for the right Led mask for my clients. I feel one doesn’t have to spend as much as for the Deesse Pro to find a good product. Am I wrong? I want to offer 20min sessions in a reclining chair, therefore I am looking for the right one mask, one that won’t leave dents in the skin and have the right lights. Please do not hesitate if you have a recommendation. But the mask is so ugly…! And you know how the clients like to instagram their sessions.. So any rigid mask would according to you wou’de be less confortable? Maybe if I put some cool eye gel patches on the eyes under the Project E?